Cordless impact wrenches have come a long way and are slowly converting even the diehard air tool guys. Most of the best cordless impact wrench kits below have two factors in common: They have a 1/2” drive mechanism and are powered by a brushless motor (all except #6). With a 1/2-inch drive, they’re compatible with common impact sockets and the brushless motor means more durability and less wear during heavy usage. Three of the cordless tool industry’s top brands are represented, and the quality is up to par with other tools made the companies. If you haven’t tried the latest in electric impact wrench technology, you’re in for a pleasant surprise. This 1/2 inch drive battery powered impact wrench is highly compact without sacrificing tremendous power from its brushless motor. In fact, we’re now to the point where a cordless model actually provides more torque than even some of the most powerful air powered models. The four mode drive control includes a bolt removal mode for improved control, while the friction ring makes changing sockets quick and easy. This best in class cordless impact wrench uses REDLITHIUM batteries for longer charge life and the REDLINK PLUS intelligence system to prevent overheating. Best of all, the tool has a premium rubber overmold that not only makes for more comfort, but also helps protect the wrench from corrosive elements. With 1,000 foot/pounds of torque and a maximum breakaway of 1,400 feet/pounds, this is easily the most powerful impact wrench on the list. Owners note (and are surprised in some cases) that it can handle almost any job effortlessly. They also love the bolt remover setting, which slows the torque to 750 feet/pounds once the fastener has broken loose, allowing for improved control. Battery life remains an issue with this tool, and even the improved battery can only handle so much before running down. This means of some particularly difficult bolts, you may use a good bit of juice breaking it loose. 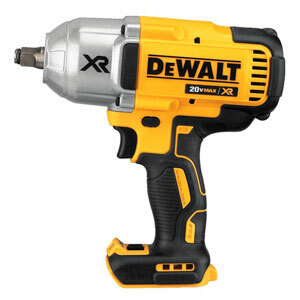 Synonymous with quality, DeWalt is a household name for good reason, as this durable tool proves. Beginning with a heavy-duty impact mechanism that brings a max breakaway torque of 1,200 feet/pounds and a max 700 feet/pounds of tightening torque, the brushless motor’s three-speed selector can be adjusted to handle multiple tasks. In addition, the hog ring allows for fast socket changes and an LED worklight provides extra visibility with a 20 second delay. Resistant to chemicals, cleaners, and grease, this tool can even handle an eight-foot drop without damage, making it perhaps the best 1/2-inch cordless impact wrench on the market for both home and industrial auto shops. Used in a wide range of automotive tasks, this tool can be found in both vehicle maintenance kits and home or professional garages. Owners of this model say it easily outperforms other models of the same class that cost several times more. 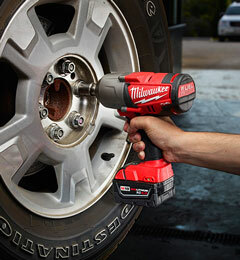 In addition, this product has a reputation for being the best cordless impact wrench for lug nuts out there. The sheer power of this impact gun comes at a price, but that price is minor for what you get. Just keep a spare battery or two on hand and you’ll barely notice the shorter battery life. As having to swap out batteries occasionally is the only common complaint with this impact wrench, there’s no reason to pass it up. Makita is one of those brands that is widely respected among professionals but often plays second fiddle to the DeWalts and Milwaukees. That’s a pity, because this cordless impact gun with its brushless motor is a real workhorse. Designed with both power and speed in mind, this wrench can loosen even the toughest lug nuts and bolts with an impressive 740 foot/pounds of fastening torque and 1,180 feet/pounds of breakaway torque – almost unheard of power for a cordless model. Three speed settings and an ability for the motor to automatically match torque and RPM allow this device to have double the runtime of brushed motors and completely eliminate the need for breaker bars. It’s hard to compare this Makita to the DeWalt above because their abilities are almost a perfect balance at the end of the day. Owners of this impact wrench tear into their work with gusto and report minimal battery impact, while the dual LED work lights mean you can easily see what you’re doing. The trade-off to this model is a much heavier weight than the DeWalt. Weighing in at a hefty 7.9 pounds with the battery in, it can cause fatigue a lot faster than lighter models. In all, consumers have reported that they get work done faster but also wear out faster, making this a good tool for shorter jobs or ones where you’ll be switching between tools frequently. 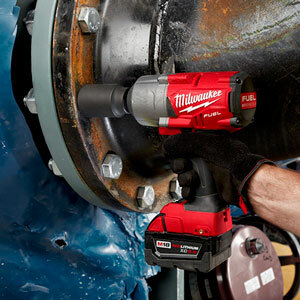 Milwaukee’s 2763-22 is one of the best cordless impact wrenches for all-purpose work, from automotive to sheet metal. It provides up to 700 ft/lbs of fastening torque, and up to 1100 ft/lbs for removal, perhaps the most powerful tool of its type. It is built with a dial mode switch that allows more torque for difficult applications and reduced torque for more sensitive work, along with a unique quick-disconnect so you can change sockets effortlessly as you go. 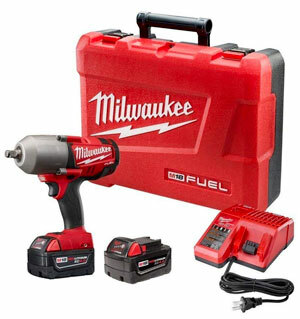 The batteries are designed for extended life, and the charger that comes with the kit can be used to charge both 18V and 12V batteries so you can use a single charger for all of your Milwaukee tools. Providing the most torque in its class comes at a price, and the batteries will wear down quickly when using the M18 at full throttle. On the low torque side, the listed Mode 1 strength is on the optimistic side, and you will probably be lucky to get to tighten to more than about 40-60 ft/lbs in actual working conditions. The most common complaint is the weight, and prolonged use will probably cause fatigue unless you can swap it between your right and left hands periodically. Overall, the kit has everything you need to get started except the impact sockets, and while the carrying case could be made with a bit more attention to quality, it works fine as a portable storage container. For something on the smaller and lighter side, and without quite as much punch, the 3-speed Makita XWT11T brushless model may be the best choice if you’ll need it for extended periods and don’t need the brute force of larger impact wrenches. 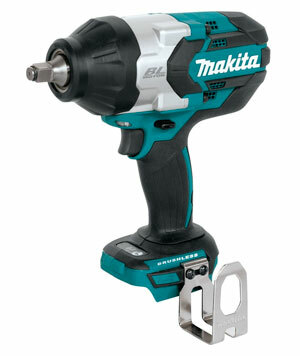 It runs on either 2.0Ah or 5.0Ah Makita batteries with the later providing up to 65% more run time. Its size allows it to go where others can’t and 210 ft/lbs of max torque are at your disposal, making it perfect for use with sheet metal, shop work, and other light to medium duty applications. 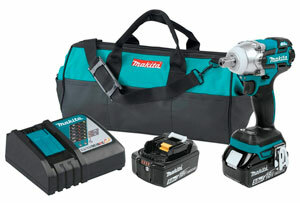 The batteries provide ample power for long use, and with battery installed, the Makita weighs only 3.8 pounds which means you can use it longer without being fatigued. This model includes a built-in power indicator that will let you know when the battery is getting low and when needed, a drained battery takes only 45 minutes to recharge. The biggest complaint is the low torque provision, and that is not so much a problem as misguided expectations. If you are looking for a smaller tool that can be used in tight spaces for light and medium applications, this is the best compact cordless impact wrench to look at. But if you need a heavy duty tool, the Milwaukee or DeWalt models at the top have the power, along with the size and weight that makes more power possible. 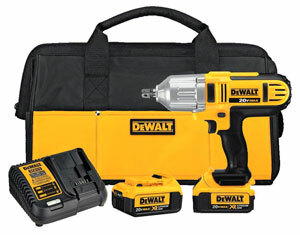 The DCF889M2 is a popular DeWalt cordless impact wrench kit. 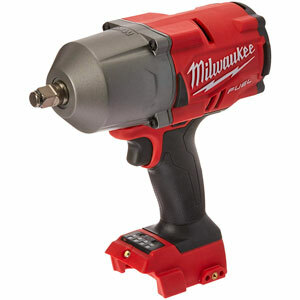 It may not have the torque potential of the Milwaukee M18 Fuel, but it is also lighter and designed to get into places a larger impact wrench can’t fit. The electric brake is nice to have, and reduces the potential for rounding nuts if you pull away as soon as you release the trigger. The drive mechanism is manufactured with magnesium to keep the weight low and the work potential high, and the all-metal transmission gives you more dependability and a longer lasting tool. It uses DeWalt’s patented XR lithium-ion batteries that pack more amp-hours into a single charge, and having 2 batteries means you can keep working for long periods with only a short break now and then to swap battery packs. The batteries are a bit of a disappointment, as they are only 20 volt batteries after the initial non-load charge, and will function at 18 volts thereafter. This could have been the top rated impact wrench, but it can’t quite match the power of the Milwaukee.